Anne Hathaway, Jeremy Renner also announced as November hosts of comedy sketch show. Bill Hader and Louis C.K. in a promo for the Nov. 3 episode of "SNL"
Even in the aftermath of Sandy, the show must go on at "Saturday Night Live." "We're doing the show no matter what happens," promises New Yorker and this week's host Louis C.K. in a new promo released Wednesday. Joining the comic will be musical guest Fun. 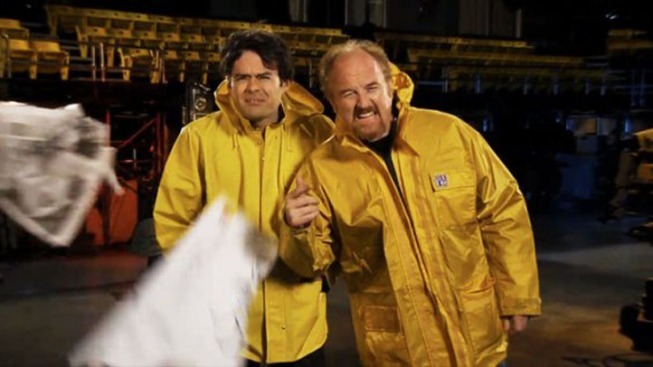 Dressed in a yellow rain slicker, the Emmy winning star of FX's "Louie" braves wind and water alongside "SNL" castmember Bill Hader. The two also star in other spots wishing all a Happy Halloween. It was also announced Wednesday that "Les Miserables" star Anne Hathaway will take the stage at 30 Rock for the third time as host of the Nov. 10 episode. She will be joined by Rihanna, marking her fourth appearance as musical guest. One week later actor Jeremy Renner will make his debut as host to promote the home video release of "The Bourne Legacy" and his new film "Hansel and Gretel: Witch Hunters" which arrives in theaters Nov. 17. Renner will be joined by Maroon 5, who, like Rihanna are also returning as musical guest for the fourth time.